Two of those interesting communiques are the sealing of the 144,000 (Revelation 7) and the measuring of the temple, altar and worshipers (Revelation 11:1). These are judicial events on those living at earth’s final period. God will measure (by some standard) His church (those calling themselves Christian), its leaders and worshipers. That Greek word is metreo – meaning “to measure out or judge." God is going to seal his saints at a specific period of time, forever securing their eternal salvation. “For we must all appear before the judgment seat of Christ; that every one may receive the things done in his body, according to that he hath done, whether it be good or bad” (II Corinthians 5:10). That’s discovery time. There is a good and a bad – thus, a standard; there is a judgment – thus, a review; there is an outcome – thus, a sentence; there is an end, thus the sealing. This means that there will be, at some point, a “divine decision” that encompasses eternity. A distinction between two groups is also noted in Revelation 6 and 7. When the sixth Seal is opened (Revelation 6:12-16), the day of God’s wrath occurs (vs 17). That relates to the time alluded to in Matthew 24:29-31 and Revelation 15 and 16 (especially 16:17-21). It is when a time of great tribulation, earthquakes and signs in the sky come – and when the wicked call for the rocks and mountains to fall on them to hide them from the “face of Him that sits on the throne” (6:16). Those lost individuals finally cry out in horror, “Who can stand in the day of His wrath?” (6:17). Contextually, both groups are the same individuals. There are clearly two “extremes” at the end of time: one group that is subject to God’s wrath and one that enjoys being in God’s presence. For God to seal a person as an eternal citizen of His kingdom, there are qualifications to be identified as forever worthy (cf. Revelation 3:7-13: the Philadelphia church members who are sealed). A useful illustration comes from Ezekiel 9. A seal was placed on the foreheads of God’s servants to exempt them from His judicial wrath (9:4). There was first a period of judicial discovery – looking throughout the city. Then there is a selection – “He has chosen us” (II Thessalonians 2:13). The word there for “abominations” is plural. Those “sins” were discussed in the previous chapter (Ezekiel 8). Those sealed resisted those abominations. Pagan practices in God’s sanctuary (church), led by church leaders, representing demonic worship and spiritualism. The true God was vacated. Honoring the dead in anticipation of their seasonal resurrection. Clearly, a detestable view of what occurs when a person dies. Worship of the eastern sun with God’s sanctuary (church) at their backs. That celestial object didn’t threaten, it was quiet and brought warmth and growth of crops. Their posture, however, is a rejection of the Creator of the heavens, and obeisance to the creation. The wicked, who are finally executed. They, by inference, are those who were most involved with those four sins that God hates. The destroying angels were to have no pity. This work of destruction was focused on those claiming Jesus Christ as their Savior but who have apostatized. Peter alluded to this: “For the time is come that judgment must begin at the house of God: and if it first begin at us, what shall the end be of them that obey not the gospel of God?” (I Peter 4:17 – KJV). Ezekiel’s spiritual characteristic of those sealed relates to their grief response to sin. The created, the sun, is worshiped instead of the Creator. This mocks the worship of God’s seventh-day Sabbath, which is to honor the “Creator of the heavens and the earth” (Exodus 20:8-11). Other characteristics that identify those who survive the great tribulation and are thus sealed (Revelation 7:14) are noted in Revelation 14:1-5. They sing a “new song” (likely the same as referenced in 5:9) that is filled with praises to the Lamb whose blood purchased their redemption. They “follow the Lamb wherever He goes” (14:4b). The 144,000 give the highest honor and loyalty to Jesus Christ, their Savior. Perhaps this illustrates partly why they worship as a heavenly choir. The symbolism that they have not been defiled but are virgins means that the saints have not compromised their lives with the world but have remained loyal as an engaged virgin bride to God (cf. II Corinthians 11:2-4, 13-15). In a chiastic tie within Revelation 14:1-5, verse 12 elevates another characteristic of the 144,000 – those translated after the great tribulation. They are with Jesus the “Lamb” – and are without fault before God (verses 1-5). Why are the views of God this way? “Here is the patience of the saints: here are they that keep the commandments of God, and the faith of Jesus” (verse 12). That is a judicial conclusion related to these individuals. They are pure in their words. Their honesty and integrity are honorable to God (cf. Isaiah 53:9, Zephaniah 3:13). They have an absolute commitment to Him in their witness. In an earlier chapter of Revelation, Jesus is described by the wondering John. “And in the midst of the seven candlesticks one like unto the Son of man, clothed with a garment down to the foot, and girt about the paps with a golden girdle. His head and his hairs were white like wool, as white as snow; and his eyes were as a flame of fire; And his feet like unto fine brass, as if they burned in a furnace; and his voice as the sound of many waters. And he had in his right hand seven stars: and out of his mouth went a sharp twoedged sword: and his countenance was as the sun shineth in his strength” (Revelation 1:13-16). He is constantly aware of the spiritual condition of His people in the churches, warning and counseling how to rectify what is at variance with holiness. There is something unique to this prophetic imagery of Christ. He is willing to share what He sees as remedial issues that would impede eternal life. He “discovers” things in those who have the potential to be sealed and advises them! He helps them prepare for what will be God’s final acts: sealing or destruction. In reviewing the seven churches in Revelation 2 and 3, one sees His judicial observations in action! These relate not only to those churches but to their individuals! Then Jesus exhorts and warns the churches individually as to what corrective steps need to be taken. This is an amazing response of mercy! This parallels the appeal that began with the Christian Church as the apostles went out pleading for repentance. Set aside sin, repent and cling to God–Jesus’ saving grace. This dual appeal does not cease till His work is done. Here, in the message to five of the seven churches, we find a pleading Jesus with an urgent command to cease what is displeasing Him. Then Jesus, in this discovery time, gives specific things He wants the congregations to do. He has special issues. Before the Revelation 7 sealing prophecy is fulfilled, enticing rewards are given by Jesus in anticipation of the saints standing around God’s throne (Revelation 7:13-17). Those eyes are emphasized in the Thyatira church (Revelation 2:18) and, later, in the picture of Christ coming to judge His enemies (19:12). Nothing remains hidden from Christ. His counsel comes at a time of grace. It is for us today. Those eyes of flaming fire are a symbol of merciful discovery, but in anticipation of a sentence and then punishment unless changes are made. When is that final time of judicial warning before executive judgment? It is at the Feast of Trumpets, when the last chance comes. Those ten days before the Day of Atonement are called “days of awe.” It is a solemn time, a final time, to make all things right with God. Stunning – that Feast always begins at a new moon, on Tishri 1. Tishri 1, regardless of the day of the week, is always called a Sabbath. John states that he was “in the spirit on the Lord’s day.” Though many assumptions abound as to what this means, contextually, this observational warning begins in the fall of the year (the Hebrew month of Tishri, when the early rain begins). Revelation 4:1-5 suggests that a Day of Atonement follows. Can this sequence be refined? “And there was given me a reed like unto a rod: and the angel stood, saying, Rise, and measure the temple of God, and the altar, and them that worship therein” (Revelation 11:1). Protection (Jeremiah 31:38-40, Ezekiel 29:6 LXX, Zechariah 1:16). Judgment (II Samuel 8:2, II Kings 21:13, Lamentations 2:8, Isaiah 28:16-17, Amos 7:7-9). The former provides for a cordon off, or separation out, of God’s true people. Therefore, they are protected. The latter, the measuring, guarantees membership in the heavenly spiritual temple. This “measuring reed” was symbolically different from the Hebrew expression, “a line has gone out” or “a line surrounds.” It is a distinct “measuring” tool, a standard. The Greek word metreo (measure) figuratively means to evaluate or measure. It relates to God’s final judicial evaluative work at the end of time (cf. Matthew 7:2, Mark 4:24). There is a group of individuals who are “validated” to be God’s witnesses (subsequent verses), who will suffer persecution. They are identified as people who will represent God, in spite of severe trials. They will be supremely successful (Revelation 11:7a). The people of God are identified as oriented to heaven. But – there is another step that must occur before they are sealed for eternity. Those who appear to have allegiance to God must be finally put under severe test or trial. 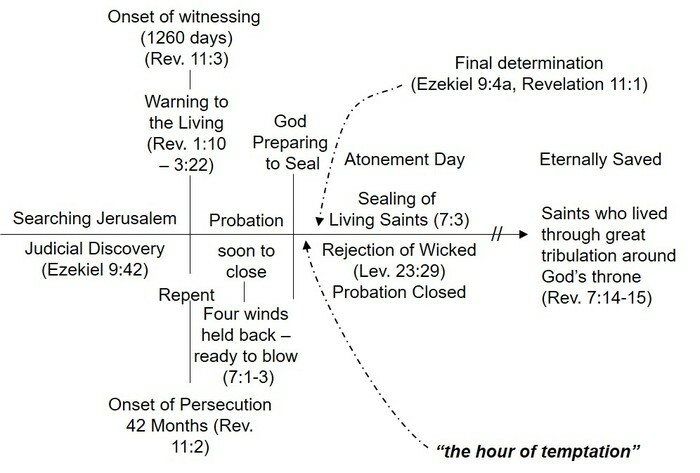 This is called “the hour of temptation” in the Philadelphia church (Revelation 3:10). “Dear friends, do not be surprised at the fiery ordeal that has come on you to test you, as though something strange were happening to you” (I Peter 4:12 – NIV). “These have come so that the proven genuineness of your faith – of greater worth than gold, which perishes even though refined by fire – may result in praise, glory and honor when Jesus Christ is revealed” (I Peter 1:7 – NET). The prophecy suggests a “journey” that leads to the sealing of the saints. There are defined steps, for which (when successfully traversed) God concludes with that seal, eternally solidifying their characters. One assures eternal life, the other eternal damnation. The seal is a sign of divine protection. This is made explicit in Revelation 9:4, which shows that forehead insignia protects them from the fifth Trumpet plague. The sequence of end-time events encompasses crucial personal commitment to God and Christ. The “purity” that comes from the final “refiner’s fire” becomes a signal to seal that saint. LaRondelle, Hans K., Th.D. ; How to Understand the End-Time Prophecies of the Bible (First Impressions; Sarasota, FL 34243 – 1997), p. 150. Stefanovic, Ranko; Revelation of Jesus Christ (Andrews University Press, Berrien Springs, MI; 2002), p. 265. Block, Daniel I.; The Book of Ezekiel, Chapters 1–24 (William B. Eerdmans Publishing Company; Grand Rapids, Michigan; 1997), p. 310. Keil, C. F. and F. Delitzsch; Commentary on the Old Testament (Hendrickson Publishers, Peabody, Massachusetts 01961-3473; 2006 – 2nd printing), vol. 9, pp. 66-73. Doukhan, Jacques B.; Secrets of Revelation (The Review and Herald Publishing Association; Hagerstown, MD 21740), pp. 70-71. Osborne, Grant R.; Revelation (Baker Book House; Grand Rapids, MI), p. 527. Beale, G. K.; The New International Greek Testament Commentary; The Book of Revelation (William B. Eerdmans Publishing Company, Grand Rapids, Michigan, 1999), pp. 737-741. Osborne, op. cit., p. 531. White, Ellen G.; The Home Missionary, November 1, 1893. Paulien, Jon, Ph.D.; Seven Churches and a Heavenly Vision, The Bible Explorer Series recording tapes, tape 3 (The Ambassador Group, Harrisburg, PA; 1996). Beale, op. cit., p. 209. Beale, op. cit., p. 559. Stefanovic, Ranko; Revelation of Jesus Christ (Andrews University Press, Berrien Springs, MI; 2002), p. 335. White, Ellen G.; Manuscript Releases, p. 15. White, Ellen G.; Patriarchs and Prophets, p. 202. LaRondelle, op. cit., p. 153. Aune, op. cit., pp. 455-456.